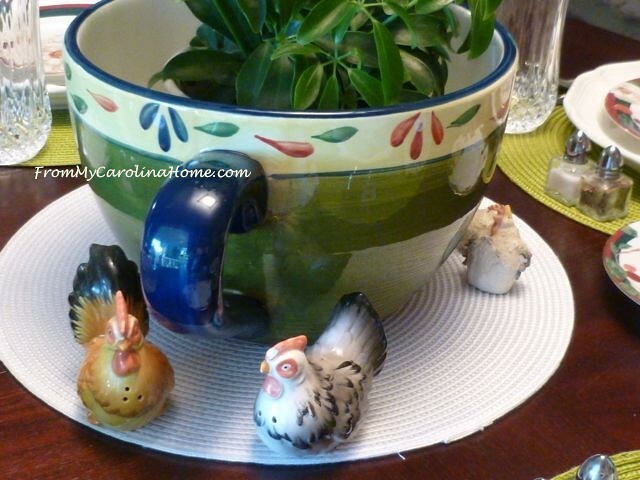 I promised a chicken inspired tablescape using the neat chicken planter I got in Myrtle Beach, and here it is! I did seriously look for some chicken plates, LOL, but not to be. 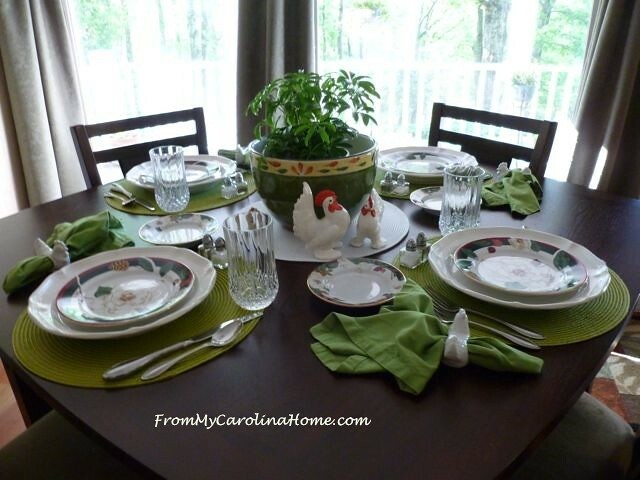 Still, the spring green placemats look good with the green on the planter. 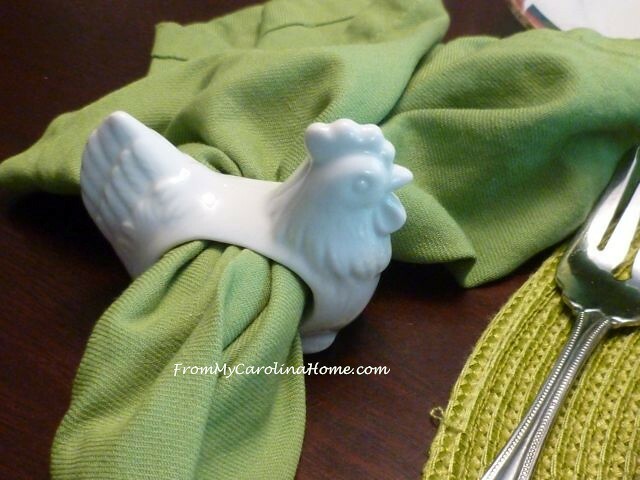 I do have some chicken napkin rings, so they came out for the spring green napkins. The magnolia plates were a thrift store score. 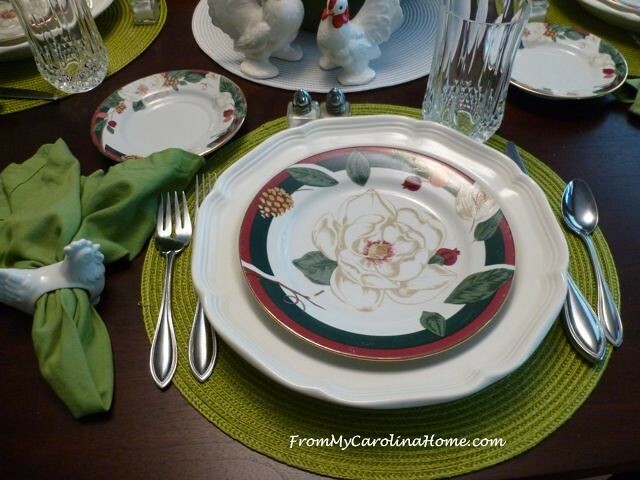 With the red and green and the pine cone, they could probably be used on a holiday table, but I think of spring with the lovely magnolia blooms in the middle. 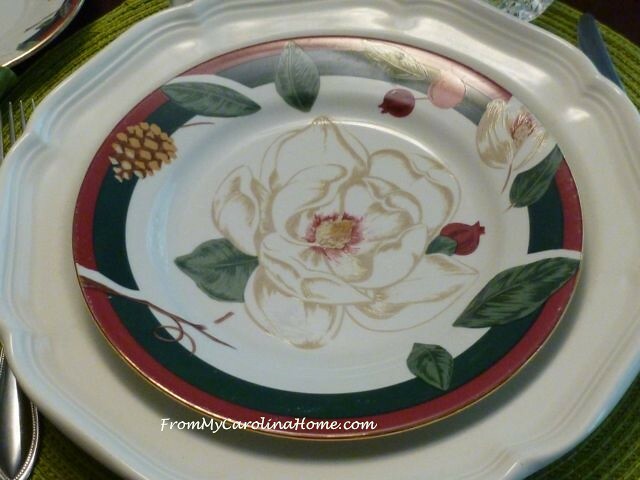 Magnolia salad plates are stacked on white dinner plates. A magnolia saucer serves as a bread plate. 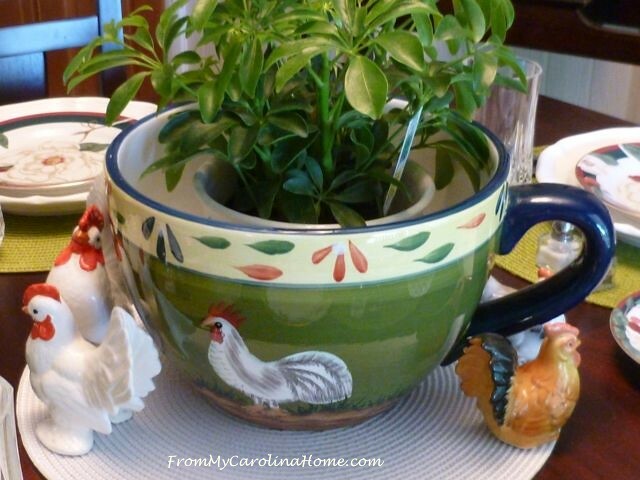 For the centerpiece, I placed a schefflera in the middle of my thrift store, giant cup, chicken planter. The plant was a gift from a friend, and I just set it inside the planter without loading it up with dirt and actually planting it. This way I can use it on the table without worrying about needing a saucer underneath. The plant is inside another planter that doesn’t have any holes in the bottom, so no worries about water leaking on the wood table. This side has a white chicken painted on the side. My grandmother’s white chickens are placed on one side. These were also my grandmother’s, a chicken salt and pepper set. I’ve had these little tiny chickens for many years. I think I originally ordered them from a catalog. The back side of the planter has a painted brown chicken. Very simple, this table is relaxed and easy, yet fun for everyday use. Outside the window is lush spring green too. Are you lucky enough to remember your grandmother’s cooking? I did a post on National Fried Chicken Day in 2015 as an homage to my grandmother and her wonderful, not to be duplicated fried chicken. Hungry yet? 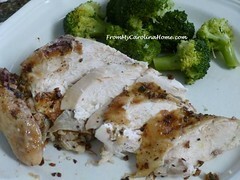 Have you tried any of my chicken recipes? 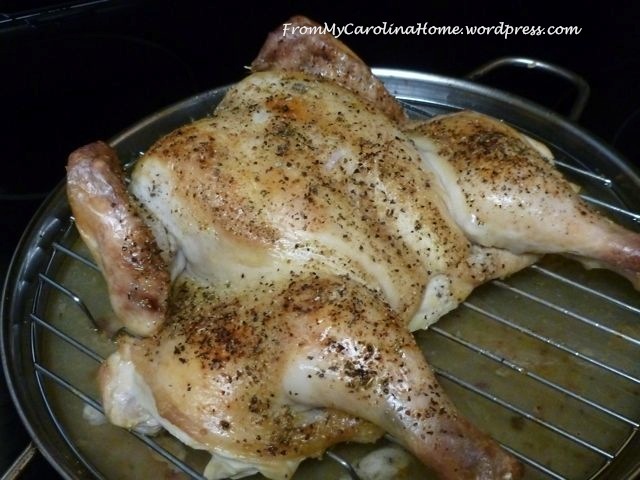 Do you have a favorite family chicken recipe? Like the tablescape, but then I am a chicken person. I’m definitely going to try the Bourbon Chicken with Mushrooms. Thanks for sharing these. Happy Mother’s Day. It is so adorable as she is working on it at her shop on her break. I do not believe I have any chicken items. 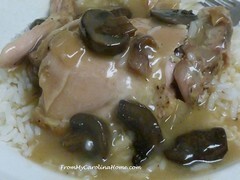 I usually just like grilled chicken with a little gravy. I have never tried any of your delicious looking recipies. I have a favorite I use now and then for fun fancy dinner parties. 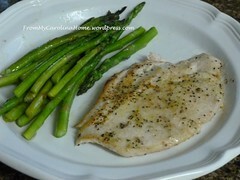 Chicken breasts in Tarragon and a creamy vermouth sauce. I have not made it in ages. How cute is that!! Thanks for sharing a darling chicken quilt. Beautiful! And all the chicken recipes are making me hungry! 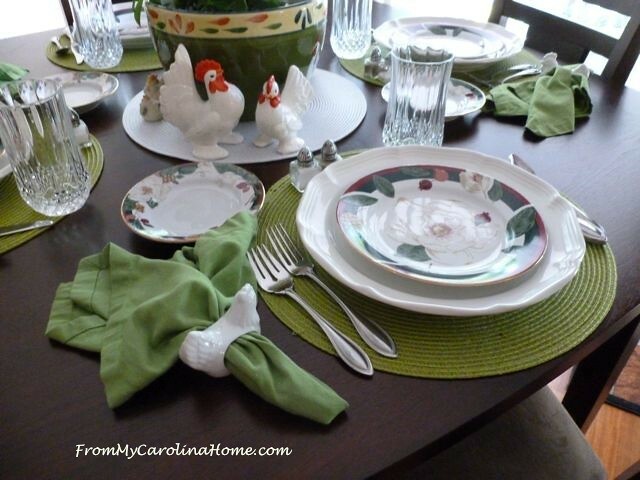 Love your tablescapes! And I am a collector of things chickens and roosters, too. My dear friend gave me a set of the chickens you have from your grandmother, although mine came from an antique store and not in as good condition as your set, but still treasured. 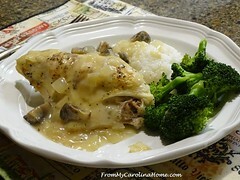 I am looking forward to trying some of your chicken recipes; thank you for sharing those. 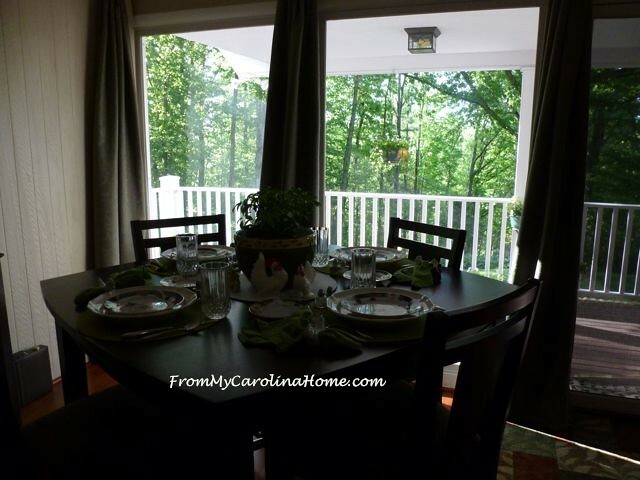 You set the most inviting tables and prepare the most yummy meals. Thank you for sharing and inspiring. Lived the chicken theme. Your food photos were amazing, too. Aww, your chicks are adorable tableside Carole! It’s a beautiful table setting. I really do love your MB find! And the chicken napkin rings and other chicks. You know, I think you might be glad you didn’t find chicken plates. I think they might have been too much. This way your eye really goes to the wonderful details of the planter, your gran’s chickens and the fun napkin rings that tie it all together. It looks like a warm and friendly table, the kind of spot where you could sit and chat for hours. Now tell me, did your menu include chicken?! 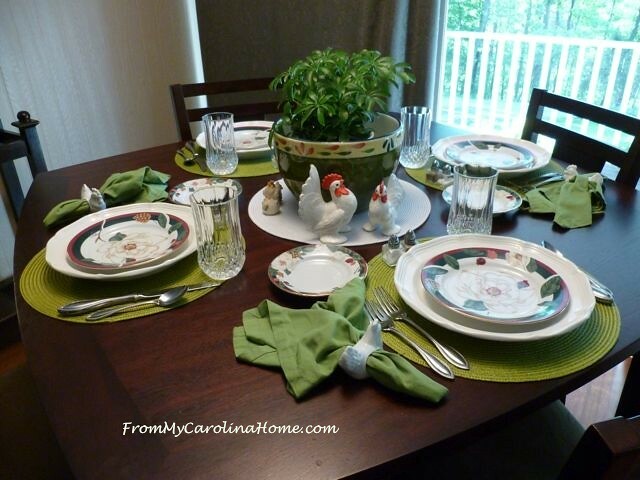 A cute chicken tablescape and chicken with bourbon! I would be a happy camper. Thank you for sharing with us this week at Celebrate Your Story, and I hope your week is going great. Your table is lovely! Love the chickens and the magnolia’s. Thanks for the yummy sounding recipes too! Very cute! 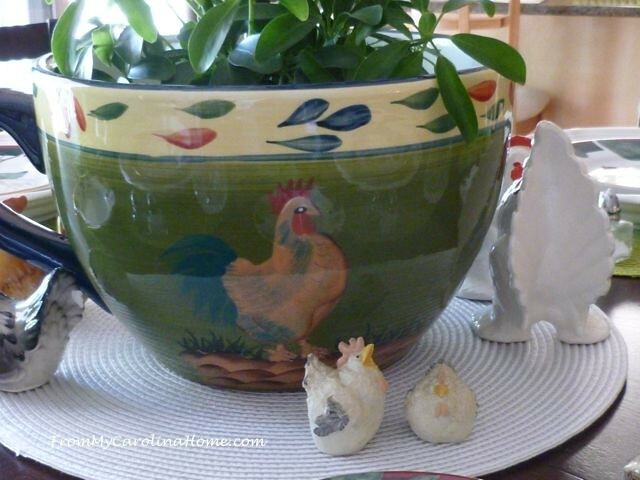 The planter is perfect in the center and I love the precious pieces from your grandmother. 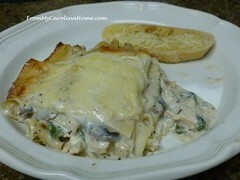 Sadly, all of my grandmothers had passed before I was born, but my mother was an amazing cook! 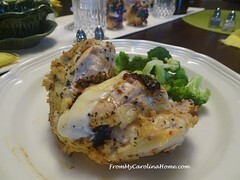 My family has two favorite chicken recipes. Sweet and sour chicken and chicken and dumplings. Thanks for sharing with SYC. Glad to see I’m not the only one taken with chickens. Thanks for the great looking recipes. I remember my grandmother made the best soup and still can taste it if I close my eyes. My other grandmother grew tomatoes and she and I would pick them and she’d slice them up and put sugar on them. The best! I’ve heard it was a German or American Dutch type thing to do. I love your chicken napkin rings and the chickens from your grandmother. The whole table is so pretty! Thanks for sharing @Vintage Charm!